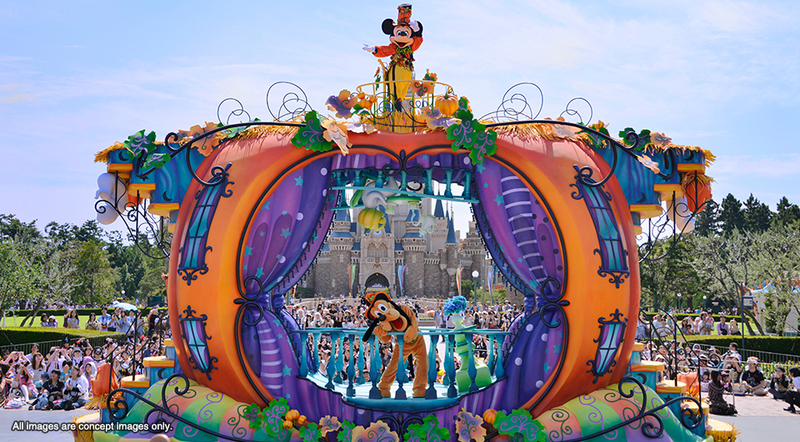 Every year, each of the parks at Tokyo Disney Resort have their own Halloween theme. This year, Tokyo Disneyland’s theme is a “Halloween Fair” and Tokyo DisneySea’s theme is “Disney Villains”. We’ll be heading over there later in the season (stay tuned for more on that! ), and the start of the season is still two days away, so all credit for the photos in this post belongs to Tokyo Disney Resort (with the exception of three of my own). Children under 12 years old can dress up any day of the Halloween season. Visitors who are 12 and over (including adults!) are allowed to dress up during the first and last week of the season at Tokyo Disneyland – that’s 8-14 September, and 26 October – 1 November. For the first time ever, Tokyo DisneySea will allow visitors 12 and over to dress in Disney costumes for three days 15 – 17 September. There are some more specific rules around which characters you can dress as. Essentially, you can dress as characters from Disney animations and/or other characters that are featured around the parks, but not characters from live action films (with a few exceptions). More information can be found on this page. It’s in Japanese only, so put it through Google Translate if you can’t read it. It’s also important to bear in mind that although it’s Halloween, it’s important to avoid compromising the image of the Disney characters – keep it clean and non-scary! Want to know more about dressing up for Halloween at Tokyo Disneyland? 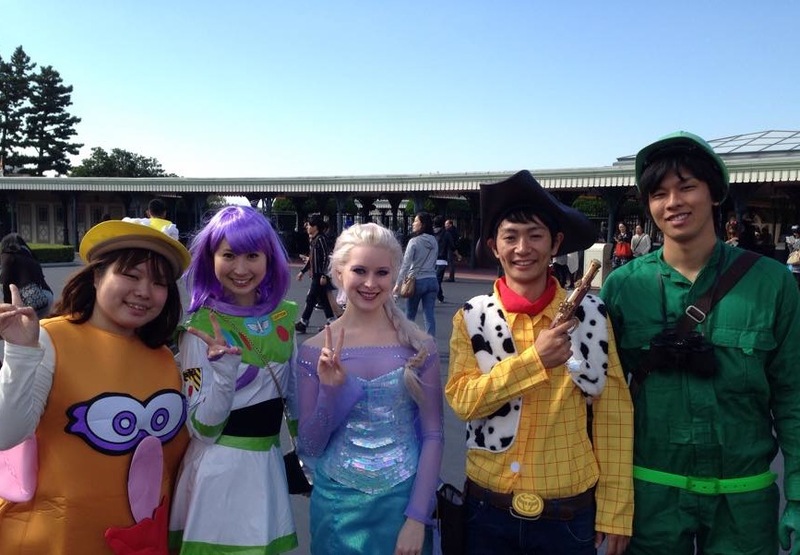 Click here to see my post on costumes and cosplay at Tokyo Disneyland 2014. Halloween is VERY popular at Tokyo Disneyland, particularly in the final week when you can dress up. This means that it can be quite hard to find a locker, so if you’re thinking of dressing up, it’s best to come in costume (and avoid bringing anything you can’t carry on you throughout the day). My partner and I usually stay in a nearby hotel (our favourite is Tokyo DisneySea Hotel Miracosta – it’s actually located within the park!) which makes it really easy to get dressed up in costume without needing to worry about finding a locker. 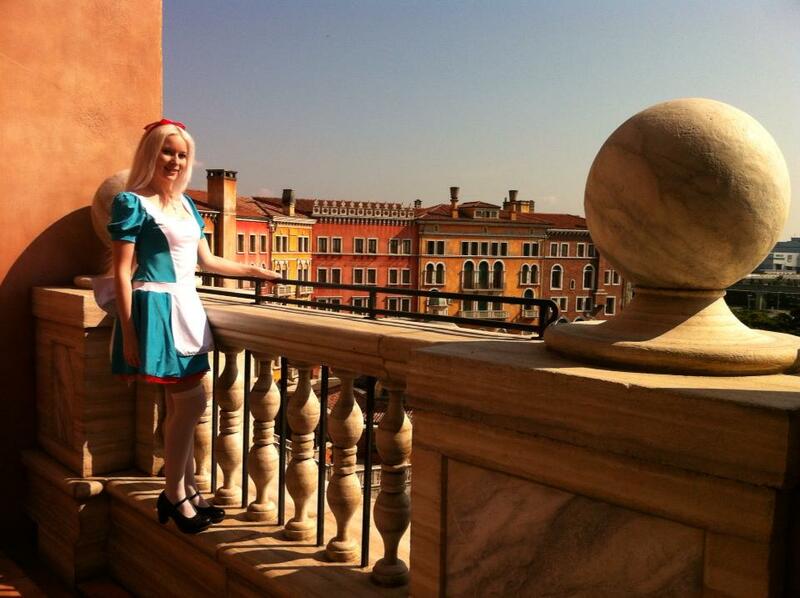 Above: Dressed as Alice in Wonderland on the terrace of Tokyo DisneySea Hotel MiraCosta. Tokyo Disneyland will have two parades per day, lasting around 40 minutes each. They will follow the regular parade route, stopping in three locations: between Westernland and Fantasyland, in the Plaza, and between Tomorrowland and Toontown. There will, of course, be fireworks at Disneyland at night, set to Halloween inspired music. Tokyo DisneySea will have three shows per day on the Mediterranean Harbor, each lasting around 25 minutes. There will also be fireworks over the harbor at night, set to Halloween inspired music. Click here for show schedules for both parks. Meanwhile, DisneySea’s Arabian Coast will be taking inspiration from Jafar, with Jafar inspired decorations, and black curry with red naan. One of the many things that TDR does incredibly well is food. There are so many options, from cheap snacks to fancy course menus, and some of it is created especially to fit with the seasonal themes. On the left is a purple chicken & potato salad and some black bread rolls, on the right is chorizo with black Mexican rice. Toward the back is pumpkin mousse cake, and down the front is smoked salmon trout & broccoli mousse, and avocado, tomato & paprika soup. The buffet costs 3,090 Yen per person for adults, 1,950 Yen for 7 – 12 year olds, and 1,230 Yen for 4 – 6 year olds. Tokyo Disneyland has brought back a few favourites this Halloween, with pumpkin churros (top left corner) from Parkside Wagon, purple sweet potato (taro) tipo tortas from Village Pastry, and Mickey and Minnie sandwich cookies (pumpkin and raspberry with white chocolate). Mickey Halloween mini snack case. Purple sweet potato (taro) pudding in souvenir cup. Mr Potato Head as Dracula popcorn bucket. Above: Sailing Day Buffet’s special Halloween buffet menu includes black pasta, black dumplings, and black bread rolls. It costs the same as Disneyland’s Crystal Palace buffet. Above: The Jafar inspired black curry and red naan from Casbah Food Court. Now these are some of my favourite TDR Halloween snacks! In the top left corner, they’ve brought out the popular blueberry cream cheese black tipo torta (available at High Tide Treats), in the middle is an apple mousse which comes in a souvenir Disney villain cup (from Zambini Brothers Ristorante) and what looks like some kind of black cake with taro inside (I will confirm this in a few weeks once I’ve eaten one of these myself – these come from the American Waterfront wagon), and a pretty cool looking two-tone Cruella de Ville dumpling (from the Refreshment Station)! I have to say that I am a little disappointed that they haven’t brought back the black hot dog from last year. I feel like the Halloween food is a little toned down this year (except for the Cruella de Ville dumpling – I think this is a great new addition). 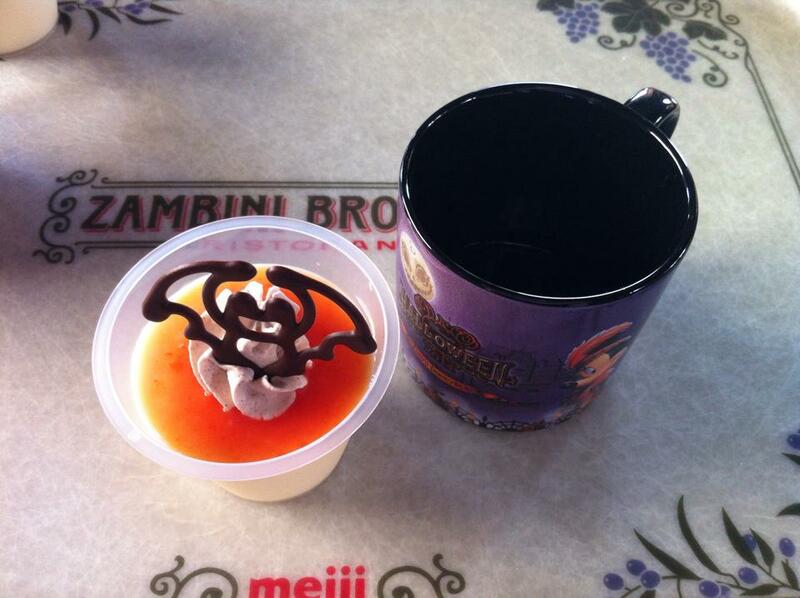 Click here to read about last year’s Halloween food at TDR. Some of the official TDR Halloween 2015 merchandise can be seen on the TDR website. In previous years, we’ve found that there are some other items available in the park that aren’t on the website, so hopefully this will be the case again this year. Mickey and Minnie in Tokyo Disneyland Halloween Fair costumes. Each year their costumes change, and you can see the year printed on their feet. Mickey and Minnie in Tokyo DisneySea Disney Villians costumes. Halloween vampire Mickey headbands have been popular for several years now. Last year’s had shinier wings and a black suit, whereas this year his wings are red with spiderwebs and his suit has red. Maleficent horns from Tokyo DisneySea. There’s plenty of other merchandise available, and yet another great thing about TDR is that not only is the merchandise really cool (and changes every year), but it’s also good quality and the prices are actually pretty reasonable. That’s about it for my TDR Halloween 2015 preview, so stay tuned for more on Disney’s Halloween when I head over to TDR in a few weeks.